This spectacular edition of the great work has all the makings of a game changer. In a mere 24 hours after release, this became our all-time bestseller. And now, in 2010, the seemingly impossible has happened: Human Action, the magnum opus of the ages, is in a pocketbook edition at a ridiculously low price. History might record that this edition is the one that changed the world. Mises's fantastic and timeless treatise has never been in a more portable, accessible, and giftable edition. Just imagine: giving or receiving this gem, this treasure, as a stocking stuffer! This is not an abridged edition. It is the full treatise from front to back, the mind-blowing explanation of the economics of freedom, right in the palm of your hand. The text is reduced to 80% of the original printing, so that it is still very readable and clean. Essentially nothing is lost in this edition, and much is gained. Indeed, it is far more impressive in real life than can be shown in the picture. In this format, a book that once seemed intimidating is opened up to the reader as never before. Truly, this could change everything. As is well known, Mises's book is the best defense of capitalism ever written. It covers basic economics through the most advanced material. 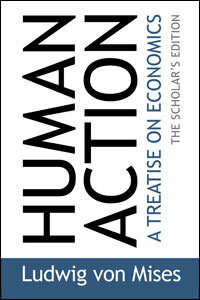 Reading this book is the best way you could ever dream up to learn economics. Every attempt to study economics should include a thorough examination of this book. Stock up! We've prepared for mass distribution. The teaching of economics is vitally important in our society, yet one would be hard pressed to find a field that has become more obfuscated or ignored. There is no excuse for this...especially when this book is available for $10. I don't want to sound like a commercial, but this is the single best book I've bought in my life. Every home should have a copy of this brilliant treatise. Obviously I made a generalization about today's HS students that doesn't apply to everyone. I have no problem recommending the book to the serious student who has a background in logical progression (fallacies and cause/effect). However, we shouldn't pretend this is economics 101. I would recommend beginning with Economics In One Lesson or The Law, as a primer; graduate to Ron Paul's Liberty Defined, then maybe to Rothbard's Power and Markets, then Human Action. There's got to be an easier progression to spark interest for the long haul, without overwhelming a young student. from Pacific Grove The greatest economic mind of the XXth century for $10! Great little paperback. The book is the size of a mass paperback. The text is small in size (smaller the MES paperback)but still readable. The pages are thin but not too thin so you can highlight without problems. It's also less intimidating than the hardback edition. At $10 it's a steal. This is great. Much preferable to the hardcover version. The Mises store accidently sent me the hardcover version, I e-mailed them and within a couple weeks they sent me the pocket version at no extra or shipping costs... and they let me keep the hardcover copy! I have both this edition and the hard cover edition and I much prefer this one. It is much more comfortable to hold and read than the larger edition and of course the size also makes it more convenient. The Mises Institute did a wonderful job on this! 4.5" x 7" x 1.25"
In this thrilling essay written in 1945, Mises lays out a theory of social organization in response to the Marxist critique of the free society. An entire book fleshing out the pure time-preference theory of interest has finally been assembled.